On occasion, you’ll read these polemics that are all about the dizzying pace of change in the modern world and about how life is accelerating and technology is constantly up-ending everything all the time time always oh my god! But I don’t buy it. It seems to me that the pace of technological and societal change has, if anything, slowed down over the last century. I mean, the internet is a fantastic mind-blowing thing, but you know what else is pretty spectacular? Refrigerators. Cars. Air conditioning. Electric lights. The radio. Movies. Cameras. Indoor plumbing, Hot water. Ready-to-wear clothing. Compulsory secondary education. The telephone. Magazines. I could go on. I’m literally just looking around my apartment and naming things I see that we still use which are, fundamentally, pretty unchanged from when they were introduced in the late 19th and early 20th centuries. Over the course of maybe fifty years, the tenor and pace of life (at least in the West) was radically altered. It wasn’t just about being able to do different things. It wasn’t just about being able to see at night or being warm in the winter, it was that everything about life was completely different. You didn’t work for yourself anymore, instead you worked for an employer. You didn’t have arranged marriages, instead you chose your own spouse. You didn’t grow your food or make your clothes, you bought them. It’s all pretty amazing. Anyway, all of these reflections are apropos of Emile Zola’s Au Bonheur Des Dames (often translated as The Lady’s Delight). I love Emile Zola. He had to me, one of the purest and most honest projects in all of literature. He was simply going to sit down and write about every single aspect of life in the France of the Second Empire. And, to my eyes, he came closer to doing that–to being truly universal–than any other author I’ve ever read. For instance, I’ve read Nana (about actresses and prostitutes), L’Assommoir (about small tradespeople), Germinal (about mineworkers), The Earth (farmers), The Debacle (soldiers), Bete Humaine (train engineers and conductors), The Belly of Paris (grocers and food vendors), and The Masterpiece (painters). And in each of them, the main enjoyment stems from his careful descriptions of daily life. Like, yeah, I do just want to know what a Paris meat market was like in 1860. That’s pretty interesting. Even today, you don’t often find novels that care about the details of ordinary human environments. Where novels do focus on setting, they’re often about strange or bizarre places. You’ll read a novel that’s all about the savage beauty of the mountains, but when the protagonist goes back to their apartment, that eye for beauty shuts itself down and everything becomes sketchy and bleak. Zola wasn’t like that. He had the rare ability to see the drama in everything. His other artistic virtue lies in the brute vitality of his protagonists. They’re often not very intelligent (at least in the novels I’ve read) or self-reflective. Frequently, they’re doomed to failure. Sometimes they’re dishonest or selfish or corruptible. These aren’t–or at least aren’t always–the virtuous poor. They succumb to laziness and to alcoholism. They sometimes abandon their families or commit terrible crimes. But through it all there’s always a powerful human-ness. 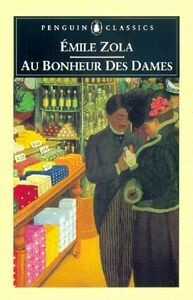 For instance, the book I’m reading is about Denise Baudu, a salesgirl at a massive lady’s clothing store in Paris. And the circumstances she undergoes are pretty brutal. Everyone in the store hates her and is conspiring to make sure she doesn’t get any good customers, which, since she works on commission, means that she has zero money. And her brother is bleeding her dry, constantly coming to her with emergency requests for more money, leaving her afraid that he’ll end up dead if she refuses. And her only other family is her uncle, who won’t speak to her because the store where she works is slowly driving his store out of business. But even though she’s at the nexus of these powerful social forces, you can still feel her trying to make a good life for herself. For instance, there’s an extended sequence where she and her one friend in the store go on a weekend trip and tromp through the fields and watch the boatsmen ply the river and go out to dine at a restaurant. There’s the scene where, flush with a regular paycheck for the first time, she finally comes down the stairs in a new pair of boots. She’s not just a symbol. She’s not just an illustration. But she’s not a hero either. Zola is good at constantly shifting from the grand scale to the petit scale. He’s good at letting you know that, okay, yes, there is this new thing–the department store–and it is a massive innovation that is going to destroy life as we know it, and there’s nothing anyone can do to escape from those changes. But, at the same time, there’s also this person, who’s just a human being that’s trying to make a good life for herself.